It’s time for an update, I think. Cathy is doing well, and Eliot is now 3 days shy of turning six months old. Below is a letter from the precocious little guy. The original post, as well as all the other missives in the El Guapo series, can be found at my personal blog. And just today, I granted my Paternal Minion the privilege of performing drunken acrobatic maneuvers while emitting childish noises. At the end of his shenanigan, I reciprocated by toppling over in a goofy fashion. I normally would not engage in such unbecoming behavior, but every once in a while one has to throw one’s minions a bone. It was worth it; you should have seen how ridiculously cute he was when he laughed! A pity the camera was on me and not him, though that is certainly as it should be. In any case, you can view the video by clicking here. Cathy’s parents have come over from China to help us take care of the baby. They are very excited about their first grandchild. 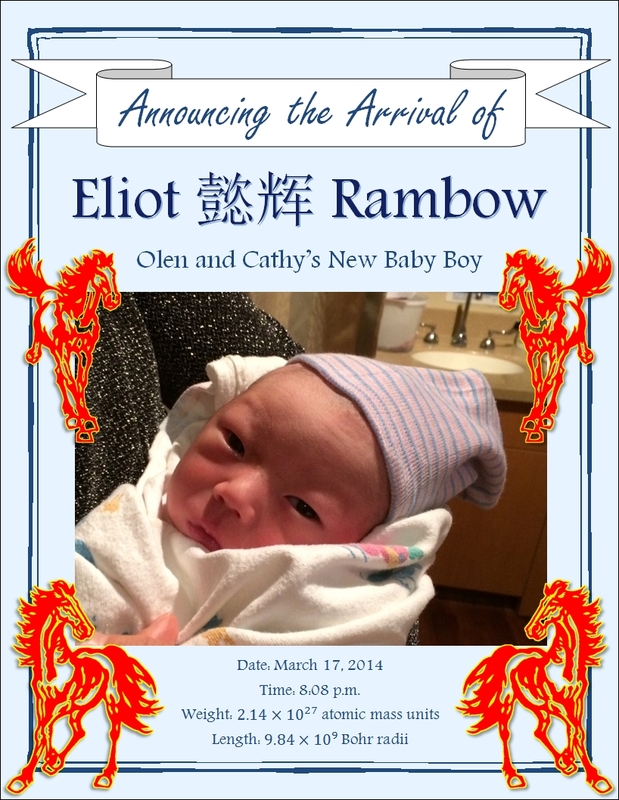 For my parents, Eliot is the first grandson and the only grandchild stationed within a 1,000-mile radius of them, so they’re pretty excited, too. A lot of other things have happened since my last post. Cathy graduated from UT Houston School of Nursing at the end of 2012 and has recently completed her first year as an RN at St. Luke’s Hospital. I finished my MS in applied physics in May of 2013 and am continuing my studies at Rice. We have a lot to be thankful for, more now than ever. 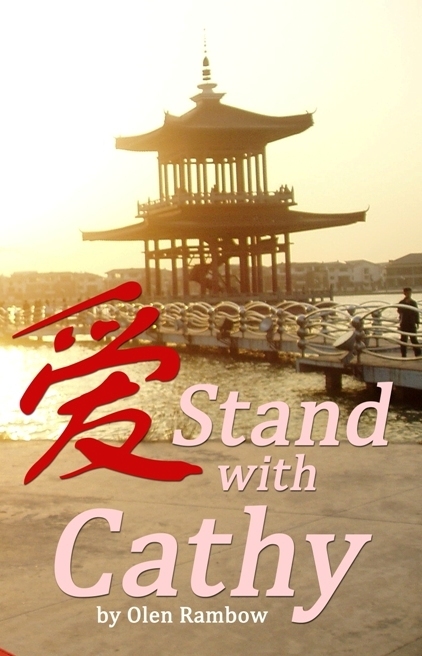 The formal release of the Stand with Cathy book will take place this Sunday, February 5, 2012, at West Houston Chinese Church. Cathy and I will speak briefly at the 11:15 a.m. service, after which we will have a table set up to sell copies of the book. Below is the first review to be written about the book. It’s by . . . me. I include some genuine quotes by friends and family members. If you enjoy the book, please log in at Lulu.com and rate it (five stars, please!) and, if you have time, write a short review. Only with my tongue firmly in my cheek can I write a review of my own book. (I always thought “tongue in cheek” was a strange idiom.) Of course I think it’s great. What I really hope is that this book will become more than a small, token gesture of support for the war against breast cancer. I hope that readers will be able to relate to this story, will find encouragement and inspiration in it, and will share it with their friends and family. And I hope that as a result, the money raised by the sales of this book will be enough to make a significant impact on the progress of breast cancer research. Maybe I’m just a dreamer. But those are my hopes. 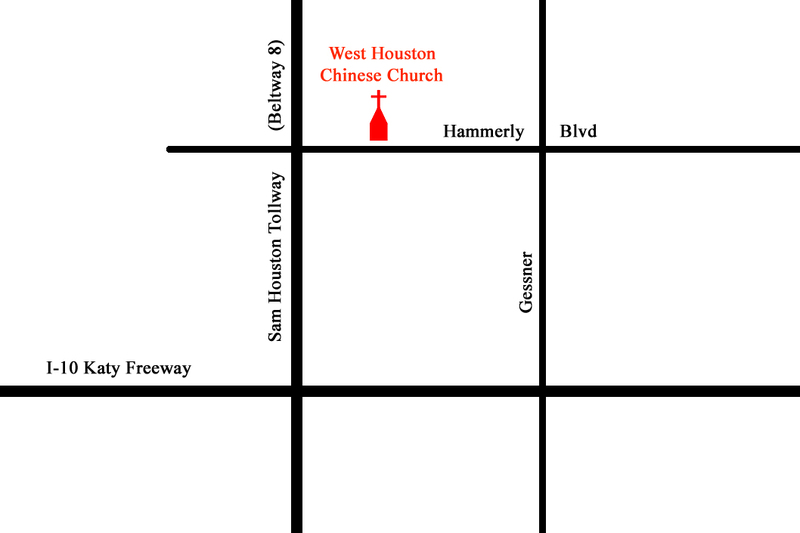 To get a copy from us in person for only $5.00, come to West Houston Chinese Church (10638 Hammerly Blvd, Houston, TX 77043) on Sunday, February 5, for the 11:15 am service. * Cathy and I will speak briefly during the service, and books will be available for sale afterward. You can also come on the following two Sundays (February 12 and 19). To order a paperback copy online for $6.99 (plus shipping), click here. To get the iBook version from iTunes (for the iPhone, iPad, or iPod touch) for $5.99, click here. 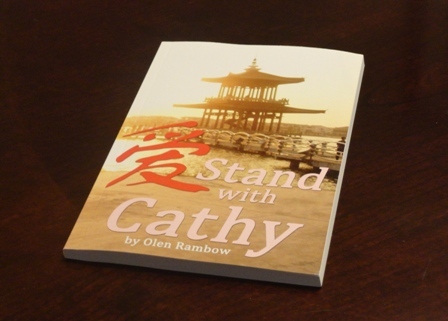 To get the Nook version for $5.99, click here, or search for “Stand with Cathy” on your Nook. For a tiny sample of the book, click here. 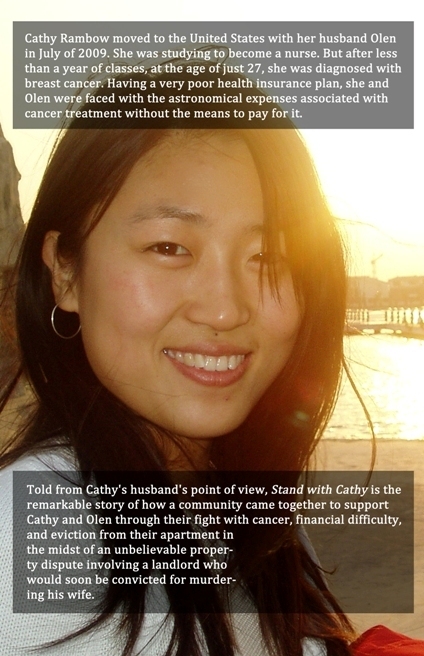 In case you’re not familiar with our story, this book is an account (from my point of view) of my wife Cathy’s battle with cancer. It’s about how our community came together to sustain us by raising over $65,000 to help pay for Cathy’s treatment and by providing a place for us to stay when we were effectively evicted from our apartment. It is a testimony about the power of love and grace in the midst of hardship. The most important news first: Cathy had her semiannual checkup on November 21st, and all of the news was good. She had a scare with some swelling on her neck, but that appears not to have been anything serious. School has been difficult for both of us. We feel SO relieved to have made it through the fall semester. It was Cathy’s first semester in nursing school and my first semester as a physics graduate student. Things started out well back in August and September. We were following strict studying schedules and getting our work done early. But then the really tough assignments began raining down on us, and our plans went down the toilet. Each of us flirted with nervous breakdowns now and then, and there were times when we really didn’t know whether we were going to make it. But Cathy got her final grades last week, and I just received mine today–and we passed. Now we can enjoy some much-needed relaxation over the holidays, though we still have some studying to do in preparation for next semester. Cathy wants to get a head start on her spring classes so that next semester won’t be quite as rough as the last; and I need to start learning about MRI, which is the field of research that I’ve chosen. Before I get back to work, however, I am determined to finish the project that I mentioned in a post back in August: to write and publish my account of our battle with cancer and all of the other crazy things that happened to us in 2010. I’m pleased to report that I’ve just finished the final draft, and I have a team of highly skilled copy editors–my mom and dad–reviewing the manuscript. The open spot in the bottom right corner is for a bar code. Feel free to send me suggestions for improving the design. I wanted Cathy’s picture to be on the front, but I couldn’t get a good layout with her face and the title together. Copies of the book should be available within about a month. I will donate all proceeds to a cancer-related benefit–probably the Komen Foundation. Please drop us a line to let us know how you’re doing. We wish you a peaceful and joyful Christmas. I made the recording just by playing on my electric keyboard and singing into my laptop microphone. I freely admit that I am NOT a vocalist, and this recording would be greatly improved with the help of Auto-Tune. Better yet, I would love to hear a true professional, such as Matt Brouwer, sing it. I wrote the first verse and chorus back in 2008 while in China. I wanted to try my hand at writing a song, but I couldn’t think of any lyrics, so I just used some of my favorite bible verses: Psalm 139 and Romans 8. The result is a bridge between the ideas that you can’t escape God’s judgment and that nothing can separate you from God’s love. This past August, I wrote verses 2 and 3 in an attempt to make the meaning of the song more explicit and tie it to the gospel. These lyrics are more original, though they’re still sprinkled with bible verse fragments and praise cliches. The full lyrics are at the end of this post. 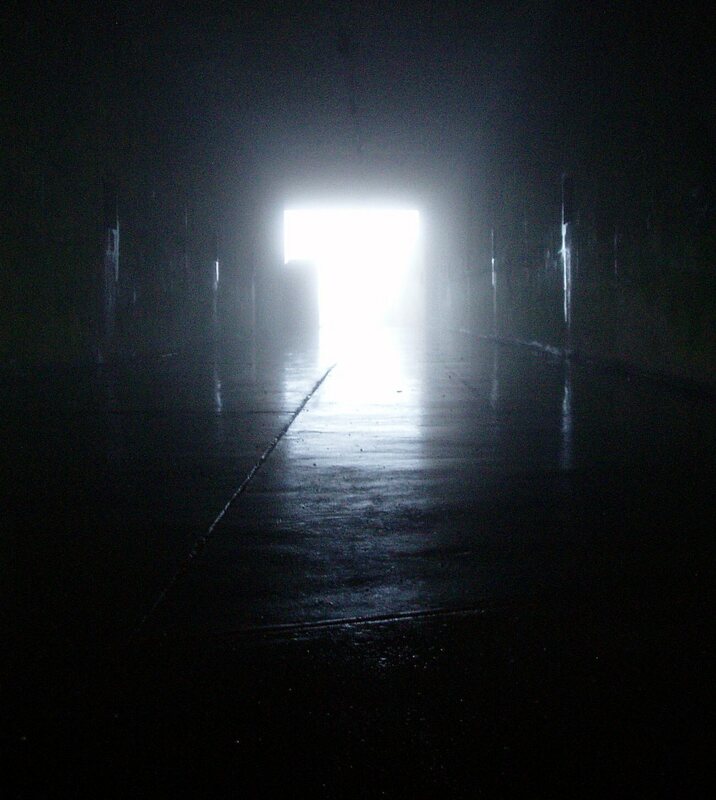 The accompanying photograph is a picture I took at an old military bunker at the top of a hill at one end of the Golden Gate Bridge in San Francisco. I’ll leave it up to you to interpret its relevance to the song. Into a tomb they sealed his body.